Take a pen. Now draw the first brand logo you can think of. If that piece of paper contains an unmistakeable bold, rounded tick, congratulations, you’ve identified the world’s most valuable apparel brand. Worth $28 billion, it’s a title Nike has held for eight consecutive years, according to an annual ranking by strategy consultancy Brand Finance. It’s not difficult to see why: boosted by smart marketing and a well-timed launch at the height of the 1970s-80s fitness boom, Nike has been imploring tentative exercisers to ‘just do it’ for more than three decades. The company’s ‘swoosh’ logo is imprinted onto our collective consciousness, with Complex Magazine naming it the most iconic brand logo of all time in 2013. However, a look at the brand’s finances suggest its dominance may be on the wane. While Nike retained its top spot in the Brand Finance ranking, the company’s brand value actually declined 12% from $31.7bn in 2017. The reasons for this are two-fold. Firstly, attrition by rival sportswear brands – particularly Adidas – has eaten into Nike’s brand equity: the Brand Finance ranking shows Adidas’ brand value growing significantly by 41% to $14.3 billion in 2018, outpacing Louis Vuitton to become the fourth most valuable apparel brand in the world. Contributing to this, consumer preferences around activewear have evolved. The rise of athleisure – wearing exercise clothing like leggings and sneakers for everyday activities, not just for playing sports or going to the gym – means that brands not previously involved with the sportswear market want a slice of the pie and are creating ranges to appeal to this new segment. From ASOS launching an Activewear section of its site to niche brands selling high-end leggings, the market is becoming crowded, and some brands are riding the wave more effectively than others. Nowhere is this battleground fiercer than in the US. Falling sales in the region were a key reason for Nike’s declining brand value, with teenagers in particular starting to shift towards Adidas’ and Vans’ more accessible everyday activewear. 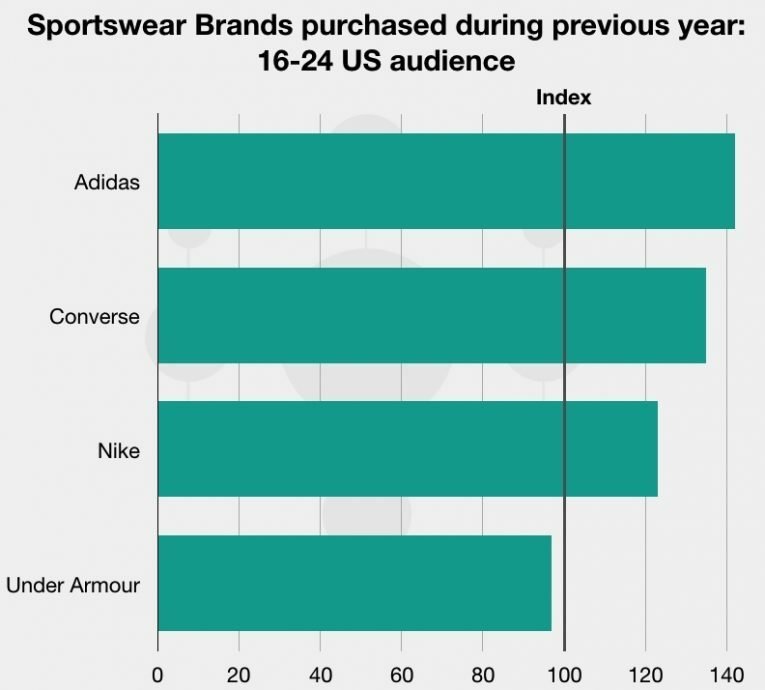 GlobalWebIndex data reinforces this trend: factoring in a broader sample of Generation Z, 16-24 year olds in the US are 42 percentage points more likely than the average US consumer to have purchased Adidas products in the previous year, and 35 percentage points more likely to have bought from Converse. Piper Jaffray’s Spring 2018 ‘Taking Stock With Teens’ survey also had some tough implications for Nike, revealing that the brand’s popularity among US teens had slipped for the first time in years. This decline was most pronounced in the footwear category, where mindshare around Nike products was down by four percentage points from the previous Fall. In contrast, Adidas rose by three percentage points on this metric. Indeed, Adidas overtook Nike’s Jordan as the number two brand for sports footwear in the US last year, bolstered by sales of its more lifestyle-orientated Superstar and Yeezy sneakers. What can Nike do to win back its US Generation Z audience? The most obvious step would be an overhaul of its product strategy, pivoting towards streetwear and athleisure, as Adidas has done with its Originals label. Young consumers want comfortable clothing that meets the needs of a broader spectrum of occasions, including jogging pants, leggings and sneakers that can be worn when hanging out with friends, not just to the gym. On a marketing level, a digital-first approach is important – these consumers have grown up online so stereotypes about a generation attached to their phones remain relevant. 35% of US 16-24 year olds, for example, have made a purchase via mobile in the past month, over-indexing by 20 percentage points compared to the average US consumer. 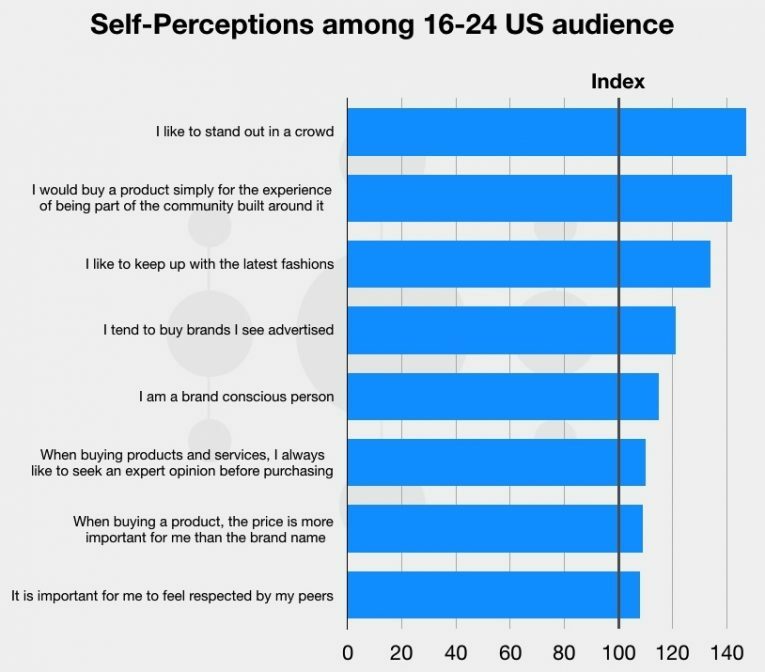 Similarly, nearly half of this audience used social networks to find out more about brands and products. However, equally important is the emotional resonance of activity. Brands should also aim to foster a sense of community to retain brand-hoppers – Generation Z consumers are slightly less likely than average to be brand loyal – and make them feel that Nike is part of their visual identity. By tapping into some of these motivations, Nike can help recapture some of the audience lost to challenger brands. It’s important to note that despite these threats, Nike remains the top sportswear brand in the world. In 2017, the company unveiled its ‘Consumer Direct Offense’, targeting consumers in 12 key global cities where it predicts 80% of all projected growth through 2020 will be achieved. These cities, which include New York and Los Angeles, are home to what Forbes identified as HENRYS (High Earners Not Rich Yet), suggesting that Nike is consolidating its strategy to target active, affluent and slightly older consumers – i.e. a different audience from those currently being drawn away in the US. For a taste of how this strategy might play out, just look to the brand’s ‘Nothing Beats a Londoner’ ad, celebrating London’s sportspeople and communities. One of the year’s advertising highlights to date, it earned a potential 94 million impressions on Twitter and drove a huge amount of brand advocacy: 41% of mentions were positive in tone. One Reddit user hailed it as “the only corporate mass ad campaign to really get the vibe of London”. As a method of growing brand advocacy by celebrating local communities, this was certainly a buzz-worthy tactic and with reach across popular media properties patronised by Generation Z, one that might attract younger audiences by default. And in an era of increasingly fractured communities, we at EntSight are excited to see how this will translate to US audiences.